As a space shared with family and friends, a living room needs to make the grade when it comes to comfort and style. Durability is key, too, for furniture that will see daily use – and that, due to its cost, you are going to change relatively infrequently. 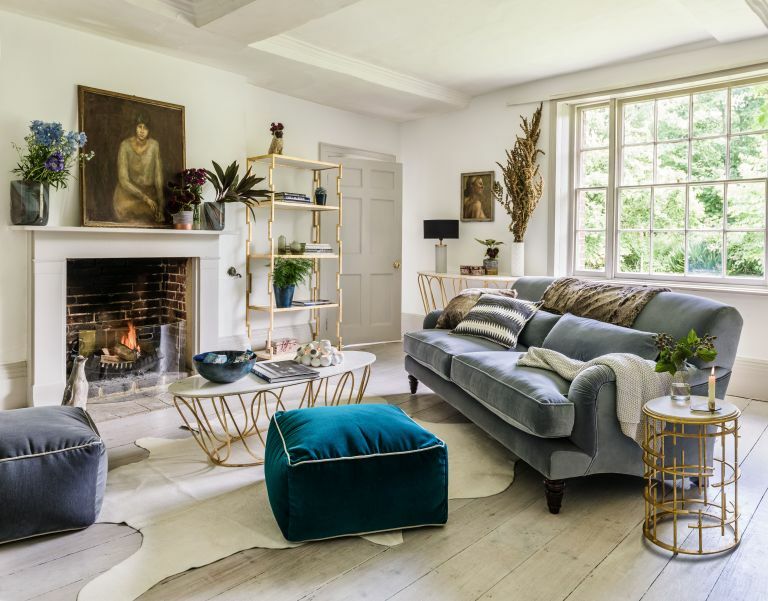 Whether you’re designing a living room scheme from scratch in a separate space or a zone of an open-plan scheme, or looking for the best individual buys to update the room, our guide has it all. Which living room furniture do you need? The furniture essentials for most living rooms? Seating, storage, a place to put the TV and home tech, and occasional tables. Homes blessed with separate television rooms or even home cinemas can skip part of the list, but most need to accommodate all of these elements when creating the best living room layout. The rigid formula of three-piece suite and a set of matching wood cabinets and coffee tables has given way to a more relaxed approach to putting together a living room furniture combination. Contemporary furniture, Mid-century designs and older pieces can all work beautifully together, so rather than sticking to one era, think of the overall look. How to make it work? Consider opting for the same wood rather than furniture range throughout, with perhaps a hero piece in dark wood or a painted finish while the remainder is pale, for example. Think furniture outlines as well. Are curves the order of the day for sofa legs and overall outline, and for side tables and armchairs? Or perhaps the long, low shape of contemporary buys suit the room better. Repeated details of colour or material can also help unite the selection. Decide on the sofa and armchair configuration that best suits the space when you’re choosing upholstered pieces. A corner sofa can help zone the seating area of an open-plan living space and, if you incorporate a chaise end, create an in-demand relaxing spot. More flexible might be a pair of sofas that can be placed at a right angle to form a sociable arrangement or give everyone a good angle on the TV. Arranging a matching pair of sofas facing one another, on the other hand, will create a formal feel that’s perfect for rooms used for frequent entertaining. Armchairs are ideal as statement pieces as well as solo seating, and can be used in corner nooks as a quiet space within a space. Consider, as well, pairs of armchairs if there’s room in a bay, or an unmatching pair to complete a seating formation around a coffee table. Whether it comes as standard or you’re given a choice, the upholstery fabric on sofas and armchairs needs to suit your lifestyle as well as delight your eye. Kids, pets, level of use and whether it will be exposed to strong sunlight are all key to the selection. Leather is durable but can stretch and crease. Pigmented versions resist soiling, but don’t look as natural as semi-aniline, which is soft but has a protective finish; aniline is also soft but will show wear. Good quality linen shouldn’t fade, but it can wrinkle. Cotton blends are hard wearing. Wool is, contrary to what you might think, comfortable year round and naturally dirt-repellant. Silk is opulent but prone to sun damage and needs to be cleaned with care. Check the rub count of your preferred fabric – a higher number means it’s more durable. Note, too, that tight weaves, high thread counts and woven patterns rather than printed make for more hard-wearing furniture. Purchasing a protective treatment for the upholstery when you buy can be sensible, especially in homes with young kids and pets. See our five quick tips for choosing the best upholstery or delve into our comprehensive guide to choosing upholstery. If plump, sink-into seating is what you look forward to, feather seat cushions should float your boat. Bear in mind that you’ll need to plump them frequently to keep them in shape. Fibre cushions are generally less expensive than feathers and soft but with more support than feathers. Again, they need plumping as the air inside is expelled. Foam is best if you prefer a firm seat. Avoid very cheap versions which will flatten with use. Some cushions combine fillings to take advantage of the benefits of each. You can’t see the frame of a sofa or armchair but the way it’s built will determine how your buy lasts. A frame that’s dowelled and screwed as well as glued is stronger, as are those made of hardwood. If you’re investing in top-end seating, look for hand-tied springs. Otherwise, S-shaped springs create a strong seat and flexible support behind. Webbing systems don’t create strong support on their own but may be used with a tensioner that fastens them to the frame. New upholstered furniture has to comply with fire-safety regulations. Don’t cut the label off, or you won’t be able to donate it to charity when you buy new once again. A coffee table can be an anchor to a group of living room seating. Think about the height of the table – low slung contemporary sofas need a nearer-to-the-floor design than more formal high seating. If it’s going to be a clutter magnet in your household, a design with drawers might be preferable. Don’t just think single coffee table, though. A series of side tables is an on-trend alternative and can be more flexible, allowing you to move them alongside seating to put a cuppa or glass within easy reach. An alternative if you’d like some softer contours and colour or pattern is a footstool placed in front of seating. A tray ensures it doubles as coffee table without liquids threatening the fabric. Clutter to conceal? Invest in a storage version with space below the lift-up lid to clear magazines, remotes, DVDs, kids’ toys etc into. If living room seating is focused on a stove or fireplace, a coffee table or footstool in front might get in the way. In this case go for side tables sited alongside furniture all the time, or tuck them against the wall until required. Televisions that aren’t wall mounted plus digital boxes and games consoles need dedicated living room furniture. Look for designs with outlets for cables or that are open at the back to keep things neat. Drawers and cupboards as part of the unit are useful to stow headphones, remotes and leads to keep the living room clutter-free. Think about the height of TV storage units relative to the sofa, matching higher units to higher seating for comfortable viewing and a coherent look in the room. The best living room storage makes space for all you need to keep in the room, has room for the display of decorative accessories, and combines open and closed options so you can show off books, vinyl records or even paperwork cunningly concealed in coloured or patterned box files while hiding all the things you don’t want to show off. Work with the room’s architectural features by making use of alcoves either side of a chimney breast for off-the-shelf or made-to-measure storage. A floor-to-ceiling storage wall is also a space-efficient way to stow. Modular shelving can create a bespoke-style arrangement without the cost of going bespoke, and can be added to later on if necessary. Sideboards used to be a dining room staple, but consider one for a living space for its clutter-swallowing interior and top surface that’s ideal for decorative accessories. It can be a pleasing focal point, too, if you opt for a Mid-century style version, for example. A living room may have to function as a home office, so, if you’re picking a desk, go for a design that’s sympathetic to the lines of the rest of the living room furniture rather than an office standard. Or, try an armoire-style desk with doors that transform it into a handsome piece of cabinet furniture when work’s finished. Other living room furniture you might want to include? A console table is handy for table lamps and display, and can function as a room divider in an open scheme. Consider additionally a window seat – either built in or freestanding – to add an extra perch as well as storage inside. Tables, shelving and cupboards should all be suitable for the weight of what you plan to store in or on them, so if in doubt, check with the supplier. Solid wood has the individuality of a natural material. For the most robust pieces look for designs with traditional dovetail and mortise and tenon joints. Furniture made from manufactured materials such as MDF don’t have the uniqueness of wood, but these pieces are built to be durable and stable in response to changes in humidity. MDF can have a painted or lacquered finish that gives it traditional elegance or a contemporary look, as preferred.